And, for the model to work, there must be at least three populations with this movement happening between them. The good news is that this is possible, provided that the U.S. Fish and Wildlife Service establishes two additional populations and lets lobos move from population to population. Officer Waskiewicz and Bo. Photo courtesy of Baltimore Humane Society. When Baltimore Police officer Dan Waskiewicz responded to a ‘vicious dog’ call, what he found instead was a new best friend! When he arrived on scene, officer Waskiewicz found a frightened, obviously neglected pit bull, being chased by children that were yelling and throwing bottles at him. He called the scared dog over, his tail tucked between his legs and panting heavily, and offered him some water. The so-called ‘vicious dog’ quickly sat down beside him and began licking his pants. 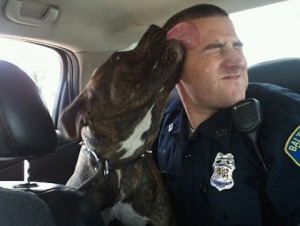 Realizing the pit bull was no threat, he put the dog into his squad car – that’s when the real kisses began! Every day there is bad, very bad or really bad news about wolves. But “Ranking Member of the House Natural Resources Committee Peter DeFazio” is speaking out for wolves. He wants the national wolf delisting rule revoked. Rep. DeFazio D -Oregon and 73 other House members, who oppose the national wolf delisting rule, are urging Secretary of the Interior, Sally Jewell, to keep wolves protected under the ESA and to “rescind the proposed rule immediately”. Thanks to Rep. DeFazio and the 73 House members who joined him. We must stop this rule. Please comment by March 27, 2014 on the proposed national wolf delisting by clicking HERE! Amazing journey!! Thanks for sharing. 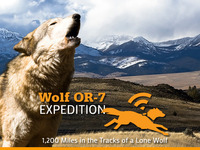 While Journey carries on his quiet existance in southeast Oregon, a group of five ambitious folks are making plans to retrace the enigmatic wolf’s footsteps, from Wallowa County to northern California, a distance of over 1,200 miles. BOISE, Idaho— The Idaho Legislature today passed House Bill 470, a bill to create a new lethal “Wolf Depredation Control Board” to administer a fund for widespread killing of wolves in the state. The bill, expected to be signed into law by Idaho Gov. C.L. “Butch” Otter, sets aside $400,000 in state funds to kill roughly 500 wolves, leaving just 150 in the entire state. The FWS needs to hear from you before March 27. Please fill out the form below to submit a letter to U.S. Secretary of the Interior Sally Jewell.